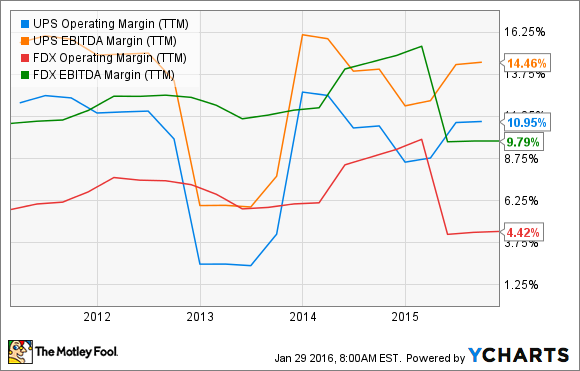 Will United Parcel Service Raise Its Dividend in 2016? Can UPS deliver to dividend stock investors? United Parcel Service (NYSE:UPS) currently doles out a 3.25% dividend yield for investors. That's a decent distribution, and one that has earned UPS a rightful title of dividend stock. But 2016 will bring about its own challenges, and investors want to know where this dividend is headed in the year to come. Here are three things to keep an eye on. Historically, United Parcel Service has always played big brother to FedEx Corporation (NYSE:FDX). It's used its size to its advantage, always offering at least three times the dividend yield of its smaller competitor. But FedEx Corporation is in the midst of acquiring Netherlands-based TNT Express to expand its European offerings. If the deal goes through, the newly enlarged FedEx would enjoy sales comparable in size to United Parcel Service. If UPS decides to take the offensive, that could mean the company funnels funds away from its distributions and toward its own growth investments. But UPS might also go on the dividend defensive, increasing its distributions to convince investors of its superior status. Either way, this FedEx Corporation acquisition is rocking United Parcel Service's dividend delivery boat, and investors may need to watch out. Even with scale on its size, United Parcel Service still has to worry about its bottom line. The delivery business is booming, but increased competition and new players could put the squeeze on United Parcel Service's margins. For now, at least, United Parcel Service enjoys the fattest margins in its industry, beating out FedEx Corporation by nearly 5 percentage points on both EBITDA and operating margins. With fat margins and and an affordable 66% payout ratio, United Parcel Service has room to grow its dividend in the year to come. If earnings drop or margins tighten, it'll be another story, altogether. A slowing economy, erratic sales, and new/bigger competition could all cause UPS to tighten its belt. Unlike macroeconomic movements or stock prices, management has a lot of decision-making power when it comes to dividends -- and United Parcel Service loves them. The corporation boasts a 45-year growth trajectory for its dividend, with an average compound annual growth rate (CAGR) of 10.3%. The company also regularly buys back shares and has plans to distribute $30 billion back to shareholders between 2015 and 2019. 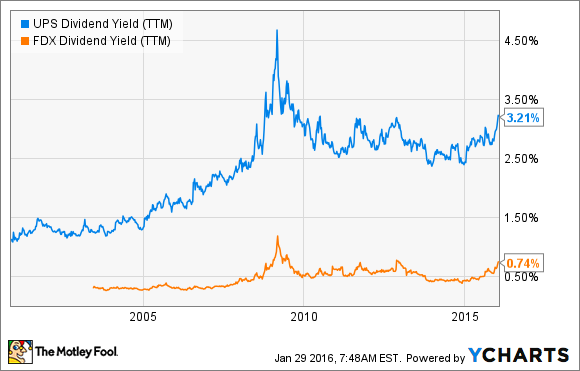 A bigger dividend in 2016? United Parcel Service is committed to delivering packages to customers and dividends to shareholders. The logistics delivery space is rapidly evolving, and each company will face its own new and unique challenges in the years to come. But when it comes UPS and its 2016 distributions, it's quite likely that United Parcel Service will deliver a bigger dividend than ever before.